The Cabinet is ground mounted and it can be equipped with 18 Chassis splitters and 14 integrated trays, outside dimensions 1050*550*310mm including the pedestal.
. Quality cold rolled steel with plastic spraying.
. Effective grounding wire fixing and protecting facilities.
. 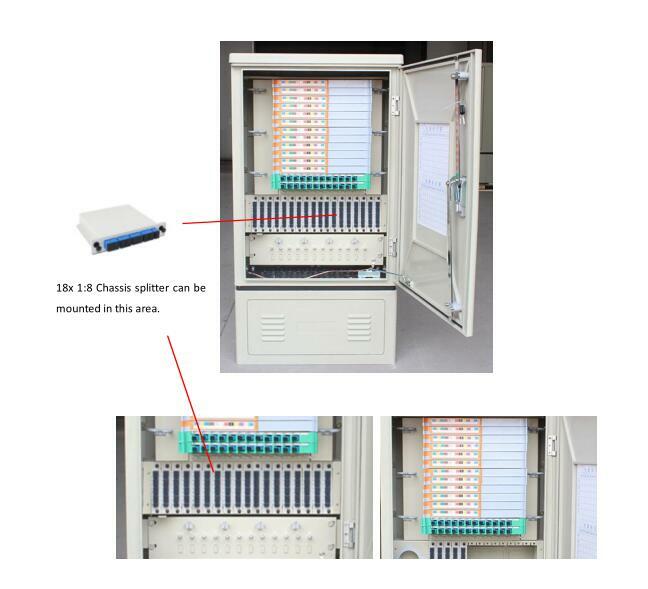 Smooth and easy wiring, lock design.
. 18x 1:8 Chassis Splitter can be deployed.
. 14 integrated tray for 12 splice and 12 patching.